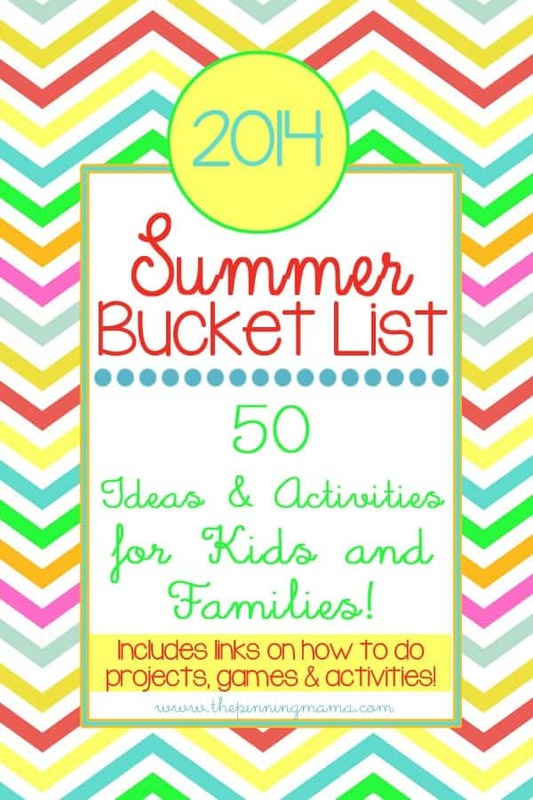 This free printable summer bucket list is filled with 50 ideas and activities for kids and families to stay busy this summer! 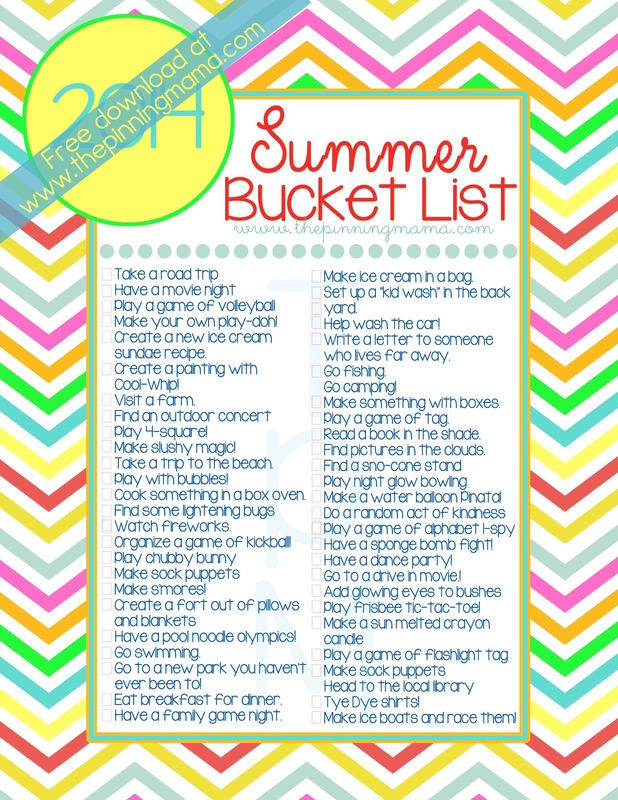 Last year we started the fun tradition of checking off a summer bucket list for all the ideas we had for activities the kids wanted to do over the summer. It was a huge hit at our house so we decided to share the list with our readers and it became one of the most popular posts of the year! You can check out the 2013 Summer Bucket List here. We keep the list handy posted in the kitchen and try to find time to do each activity over the course of the summer. 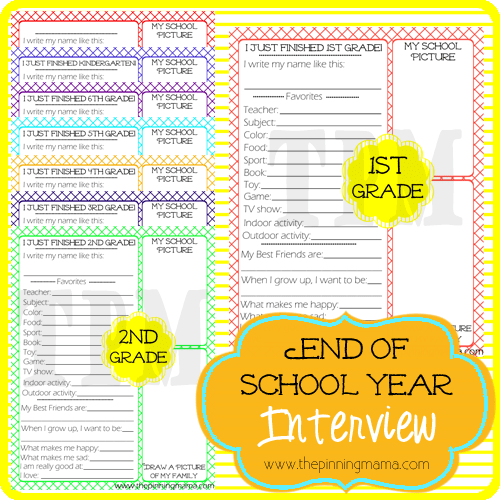 Some are easy and the kids are excited to check them off right away and some are more challenging and we have to work together to plan to make them happen. 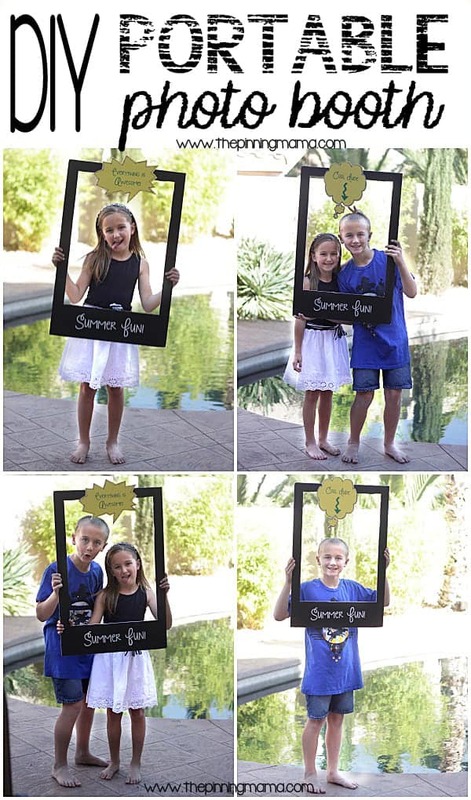 Either way, these creative ideas are sure to help you make lots of memories along the way! I tried hard to include links that will help you learn how to do or make anything that needed a little extra explaining but please let me know in the comments if you have more questions! If you decide to do this with your family we would love for you to keep up with the fun by posting your pics on Instagram with the hashtag #TPMSummerBucketList. You can follow our fun on the TPM Instagram page here or by searching the hashtag. Also, you definitely want to follow the TPM Summer Bucket List Pinterest board where we add more fun summer ideas all year long! You can download the bucket list filled with my ideas or a blank copy to fill in with your own ideas by scrolling to the bottom of the post! 1. Take a road trip- Find something fun within a couple of hours distance and pack up the car and go see it! Here is a list of road trip essentials to keep you sane on the road! 2. 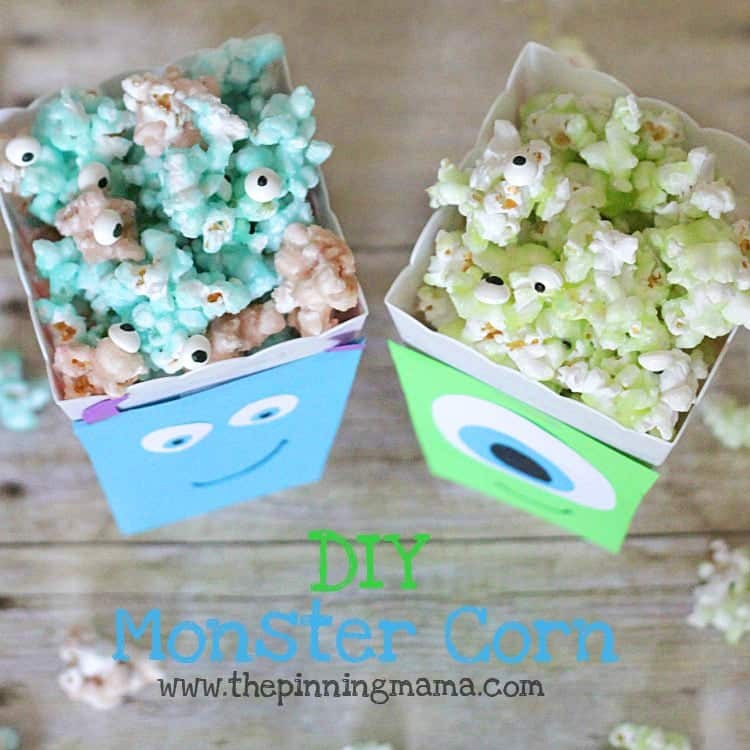 Have a movie night where you make popcorn and fun drinks and enjoy your family favorites together! 3. Play a game of volleyball with family or friends! Do it in the back yard or go to a park that has a sand volleyball court. You could even make it extra fun by trying this trick to make your volleyball glow! 4. Make your own play-doh! You can even try this yummy edible version. 5. Create a new and delicious ice cream sundae recipe. You can get an attachment for your KitchenAid Mixer to make creating new flavors all summer long a cinch! 6. Create a painting with Cool-Whip! See how here. 7. Visit a farm. Learn things that are locally farmed in your area. 8. Find an outdoor concert in your area and picnic and enjoy the music. 9. Find some friends and play 4-square! You can use sidewalk chalk to draw a court on your patio, drive way, or play ground! 10. Try your hand at making slushy magic! Find the yummy method for making slushies here! 11. Take a trip to the beach. If you can’t get to the beach, bring it to you by making castles with this moon sand. 13. Try a science experiment to see if you can cook something in your own homemade box oven. 14. Find some lightening bugs or just make some like they did here! 16. Round up your neighborhood friends and organize a game of kickball! For a fun twist hook up some sprinklers to make it a wet and crazy game! 17. Play a family game of chubby bunny and crown the champion with a crown of marshmallows! 18. Make sock puppets and put on a puppet show. 19. Make s’mores! If you don’t have access to a campfire or fire pit, you can roast marshmallows under the broiler in the oven! 20. On a day you can’t go outside, create a fort out of pillows and blankets and eat lunch inside. 21. Have a pool noodle olympics! For some great game ideas, look here! 23. Make a trip to a park you haven’t been to! 24. Eat breakfast for dinner. 25. Have a family game night. Play your favorite board games. 26. Make ice cream in a bag. Here is a great how to! 26. Set up a “kid wash” in the back yard. 27. Help mom and dad wash the car! 28. Write a letter to a family member or friend who lives far away. 29. Find a local lake or pond that is stocked with fish and go fishing. 30. Go camping! We have tons of great camping ideas on our Summer Bucket List Pinterest board. 31. Find some card board boxes and make something fun out of them like this awesome pirate ship or these slightly more doable cars. 32. Play a game of tag. 33. Read a book in the shade. 34. Find pictures in the clouds. Draw them on paper. 35. Find a snocone stand and get your favorite flavor! 36. Have a night glow bowling tournament! See how to make glowing pins here! 37. Make a water balloon Pinata! 38. Do a random act of kindness for a friend or neighbor! Here is a whole list of ideas! 39. Play a game of alphabet I-spy in the back yard, the park, or around the neighborhood. There is a free printable for you to use for your game here! 40. Have a sponge bomb fight! They last longer and are less time consuming than water balloons to fill up! See how to make them here! 41. Buy some glow sticks at the dollar store, put on some music, and have a dance party in your back yard after the sun goes down. 42. Go to a drive in movie. 43. Dress up your bushes with some glowing eyes like they did here! 44. Play frisbee tic-tac-toe! Draw a giant tic-tac-toe board with sidewalk chalk or make a reusable one like this! 45. Make a sun melted crayon candle – instructions here! 48. Head to the local library and check out some books! 50. Make ice boats and set them to sail in your pool or kiddie pool! See how here. Like freebies? You definitely need to follow us on Facebook where we share many more! 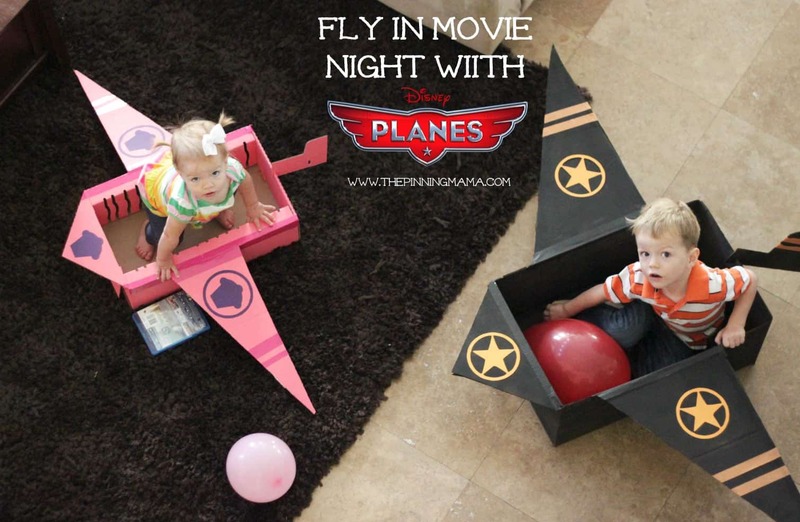 Want even more fun kids ideas? Follow us on Pinterest where we share the best! See these other posts that you might love! Click the photo to go to the post! 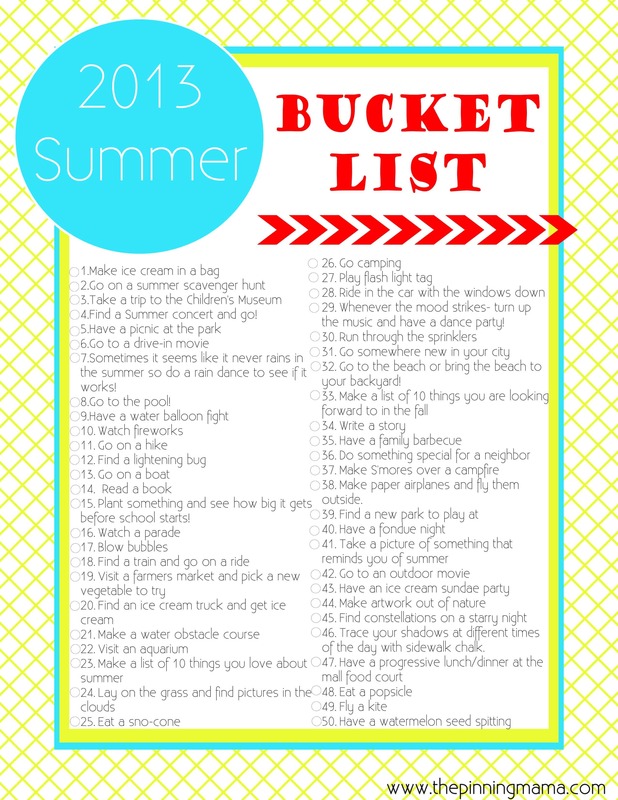 You can download our Summer Bucket List printable below. If you love it, we would just ask that you take a quick moment to pin it to Pinterest or share it on Facebook using the icons in the share bar at the top or bottom of the page. It helps support our site by spreading the word and it keeps the freebies free! Thank you so much!! I love this list, Especially the Water Balloon Pinata!! Thank you Steph! My family and I always have so much fun checking off our list before the summer ends! I can’t get the link to the blank, editable list to work! Help! Hi Rachel! I checked the link and updated it. It should work now. Sorry about the confusion!